One of the coolest and most practical things I saw at last week’s Dwell on Design New York, held in the gritty industrial (and very cool) West Soho neighborhood, was the market debut of The Hub, a wall-mounted home base to organize, use, store and recharge technology devices. 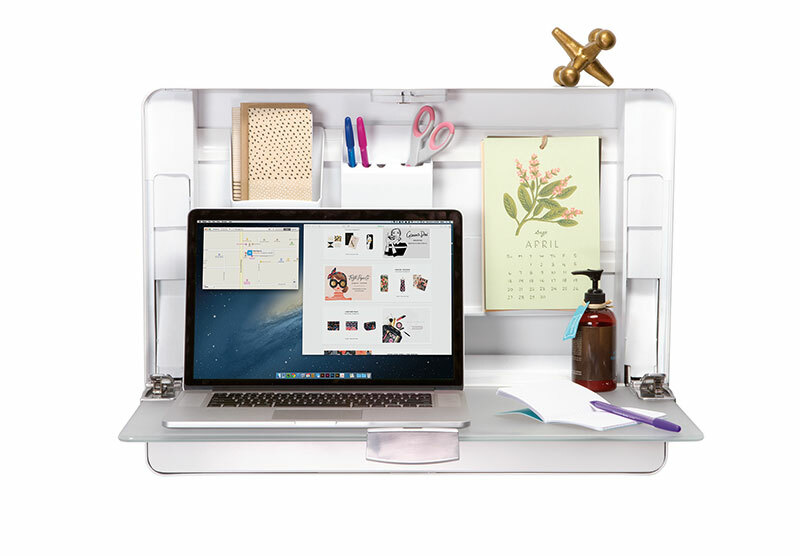 Ergotron’s Hub series easily shifts for compact storage and charging station to work surface. A slim 3-inches closed, the Hub opens up to provide storage for a laptop, tablet, phone and a few assorted pens and notepads. Developed by ErgotronHome, the Hub has two models, the more compact Hub24 (approximately 24” wide and 16.5” high) and the Hub 27, which is not only larger (27” w x 20” h) but also has the added features of a key-lock security and adjustable work surface. What I loved: Its clean, modern compactness and style that combines visual design simplicity with mechanical efficiency. Thanks to its wall-mounted design, Hub series are eminently practical, not just for us space-starved New Yorkers, but any home where technology constantly overtakes any surface. What I’d tweak: The glass drop-down door. Although sales manager Zach Eyman assured me the work surface had been weight-tested, I still felt a bit uneasy about the idea of working on a glass surface. Sure, it makes a nice write-on memo board, but so does whiteboard. More color options. Though its white and glass scheme will certainly blend with most any home decor, I would love to see the Hub is a selection of bright colors (think the Poppin line of stationery supplies) that can add a pop of color to a wall. Zach told me they got some similar feedback from retail buyers (hello Target) so perhaps we will be seeing color models in the 2.0 version. Where to buy: Available soon at http://www.ergotronhome.com/. In the meantime, check out Ergotron’s great line of sit-to-stand desktop options that I hope to cover in a future post.